Translucent white with an excellent polish. Xingjiang literally means “New Frontier” and was named in the mid 1700’s when it was conquered by the Qing Dynasty. 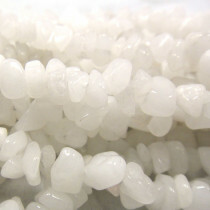 The Jade of Xingjiang stands out among the varieties produced in China as having an “excellent reputation”. Also known as “muttonfat” jade in the past because of its smooth texture and pure colour.Jade is considered to possess the power of good luck and good health. It has the ability to resist evil spirits and get rid of bad luck. 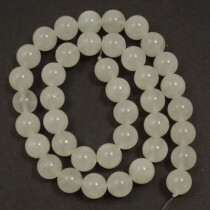 A-Grade Xingjiang Jade stone Coin 12mm (33pce Strand) - 40cm/16'" Strand. 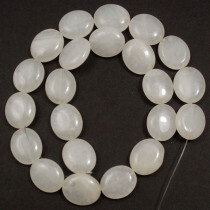 A-Grade Xingjiang Jade stone Oval 15x18mm (22pce Strand) - 40cm/16'" Strand. 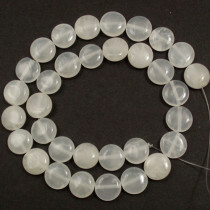 A-Grade Xingjiang Jade stone Round 4mm (~100pce Strand) - 40 cm /16'" Strand. 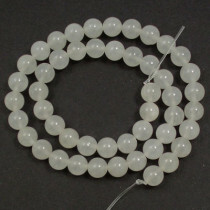 A-Grade Xingjiang Jade stone Round 8mm (~50pce Strand) - 40 cm /16'" Strand. 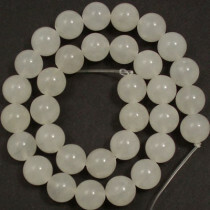 A-Grade Xingjiang Jade stone Round 10mm (42pce Strand) - 40 cm /16'" Strand. 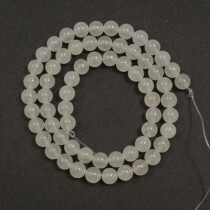 A-Grade Xingjiang Jade stone Round 12mm (33pce Strand) - 40 cm /16'" Strand. 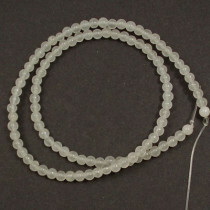 Xingjiang Jade Stone Chips 5x8mm (~160pce Strand) - 91cm /36'" Strand.